From the start, Josephine Baker was a survivor. The girl was a true Diva and artist! She was bigger than "jazz"... she was a "personality"... Far from the glitter and gaiety that characterized her beloved Paris, Baker's beginnings were harsh and difficult. Born in the slums of St. Louis, Baker grew up sleeping in cardboard shelters and scavenging for food in garbage cans. At age 13, Baker left her parents' house and got a job as a waitress. Soon afterwards, she married Willie Wells. However, the marriage ended in divorce, and she returned to waitressing. She then joined a group of performers, the Jones Family Band, and had her stage debut at the Booker T. Washington Theater, a black vaudeville house in St. Louis. It is probably vaudeville that saved her... alot of creative cats used vaudeville as an outlet for their creativity. Vaudeville was a shelter for blacks in a time where they hadno place to perform! By age 18, she was out of Missouri, had been discovered in New York and was performing with numerous troupes in various stage productions. Some of these productions included the Folies-Bergeres, Ziegfeld Follies, and the famed Le Negre Revue in Paris. In Le Negre Revue, Baker danced with a male partner; her costumes consisting of a skirt of feathers. It was in Paris that Baker's transformation began. As usual the Europeans loved the black performers.. yeah baby! They couldn't get enough of them and the exoticness of them was intriguing as well! For a city that was bursting with the spirit and rhythm of jazz, Baker was a perfect match. She was an entertainer and dancer, known for her contortionist positions, striking ebony features, and goofy, cross-eyed face. As she swang from a trapeze at the Folies-Bergere or tossed flowers to her audience, Baker embodied the pain and emotion of the times. During the early 30s, Baker toured Europe, recorded songs for Columbia Records, and starred in two films, Zou-Zou and Princesse Tam-Tam. In 1935, Baker returned to the United States searching for the success she had in France. However, American audiences weren’t ready for a black woman with the style, grace, and sophistication that Baker possessed.Ha Ha! She was too much for the white cats back "home"! Before returning to France, Baker divorced her second husband, Willie Baker, who she had married in 1920. In 1937, she married Jean Lion, a French sugar broker, and became a French citizen. However, the marriage ended 14 months later. The lady had good talent but bad luck with dudes! A story that is consistent with most relationships in jazz when it comes to Diva women and husbands... the dudes just couldn't seem to take it that a woman was better or more talented than them! With the rise of Hitler, Europe experienced a transformation which affected Baker in several ways. In a Europe split with hate and intolerance, Baker engaged in undercover work for the French Resistance during World War II. She became an "honorable correspondent" and became sub-lieutenant in the Women’s Auxiliary of the French Air Force. When I say she was "BIGGER THAN JAZZ" this is what I mean.. she was a figure-head for a civil rights generation before Martin Luther King! In 1940, Baker moved to Morocco. In 1942, she toured the region performing for the resistance. She returned to France in 1944, got married in 1947 to Jo Bouillon, an orchestra leader, and was back in the States in 1948, where she became an activist for civil rights. Baker was back in France in 1954, with the intention of raising a family of ethnically diverse children that she had brought to France from her tours around the world. She called them her "Rainbow Tribe." In her last years, Baker suffered struggles, financial difficulties, and poor health. In 1973, she married Robert Brady, an American artist. She died on April 12, 1975, four days after the opening of Josephine, a show based on her life. Her funeral took place in her beloved France, the country which she had adopted as her home. Although Baker's life was full of struggles to overcome the difficulties and limitations, she lived her life passionately. She had four spouses, adoring audiences, and she closely related with celebrities such as Grace Kelly or Maurice Chevalier and important politicians such as de Gaulle, Castro, and Mussolini. 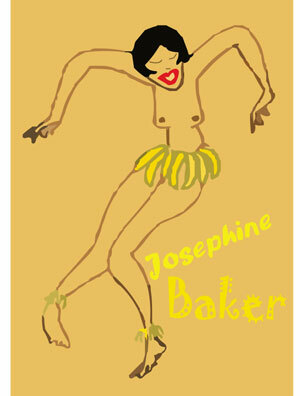 Many years after her death, Josephine Baker's charm, vivacity, and captivation live on and so does her legend... The lady had a big heart and was a DIVA in all manner of speaking!